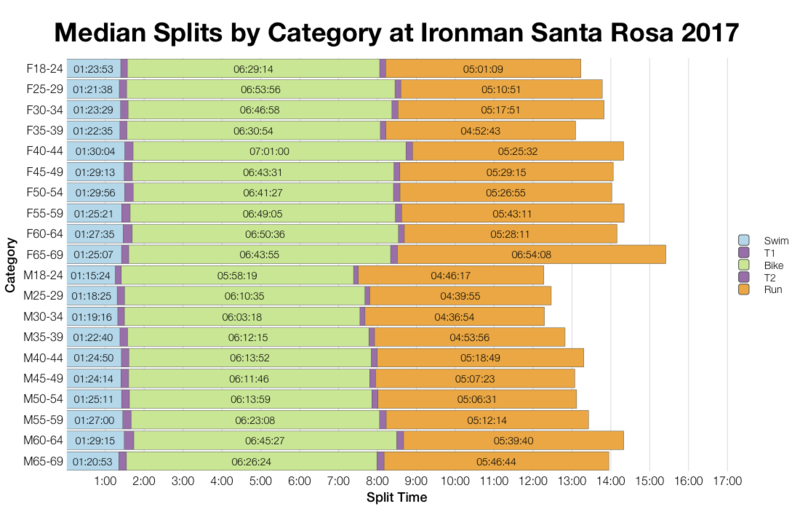 Ironman Santa Rosa is new to the Ironman calendar and as such I don’t have historical data to compare it against. As a first time Ironman it has the standard 40 Kona slots and attracted a decent field of over 2,000 athletes. 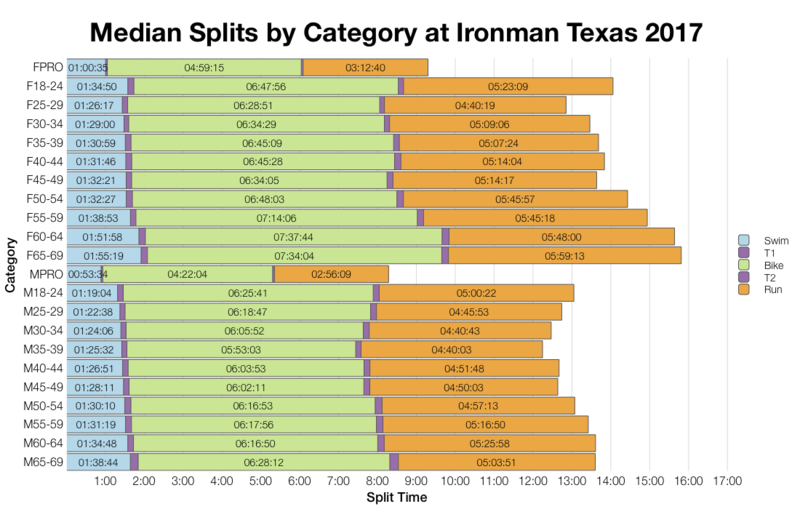 The lack of historical results limits the analysis a little, but I’ve chosen to use Ironman Texas 2017 as a comparator. In theory, as the US Championship race, it should draw a good quality and consistent field for comparison. Practically I’m not sure how much difference a championship title and extra Kona slots makes to the age group race. It gives a point of reference though. Santa Rosa did have a faster swim than Texas, but otherwise it was a slower race. This is particularly true at the front, the different in the 5th percentile times between the two is larger than at the median. Probably a reflection that Texas does attract more fast athletes for Kona slots. At the median the time are only slightly slower in comparison. Comparing DNF rates against all the championship races of 2017 puts Santa Rosa at the higher end of the numbers. This appears to be largely due to run DNFs. Although it’s on the high side in this comparisons, these figures are far from extreme for an Ironman. As with the distributions, median splits for age groups tend to be slower in Santa Rosa. As you’d expect this was a largely US dominated race with a small mix of other nationalities present. The majority of slots went to the US competitors in proportion to their number. 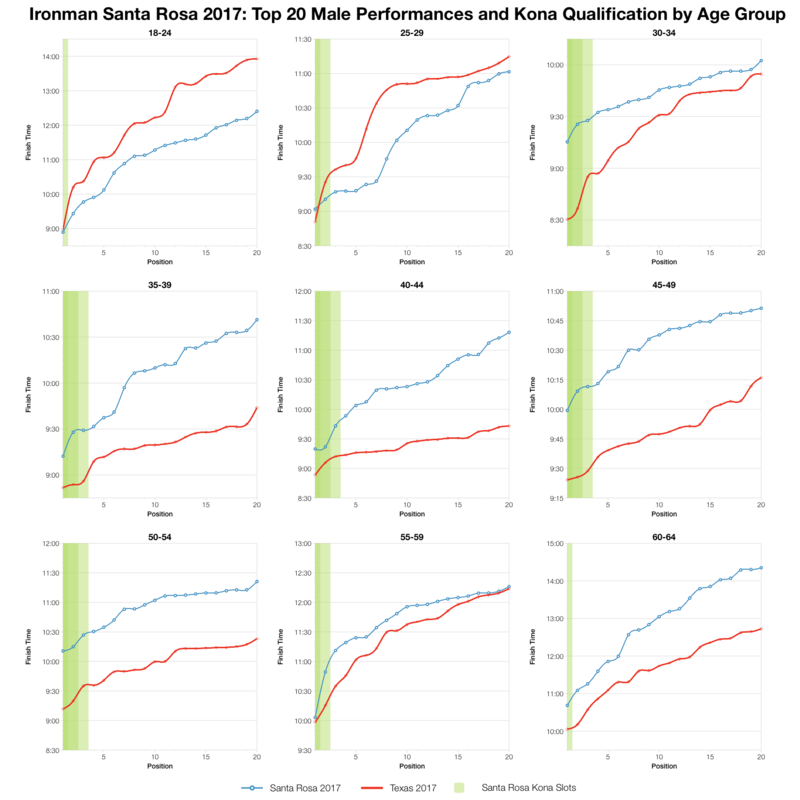 For the majority of age groups the top twenty times in Santa Rosa are much slower than those in Texas. A few age groups buck this trend, but it’s consistent across the biggest divisions. The drop off in times for the top twenty is generally steeper too, suggesting a shallower field at Santa Rosa. Clearly the championship race attracts a stronger field with its additional Kona slots. I’ll finish with the table of Kona qualifying times. Based on the results list I’ve estimated the slot allocation in Santa Rosa and what that would predict for automatic qualifying times. In practice this may vary and roll downs will impact the final qualifying times. 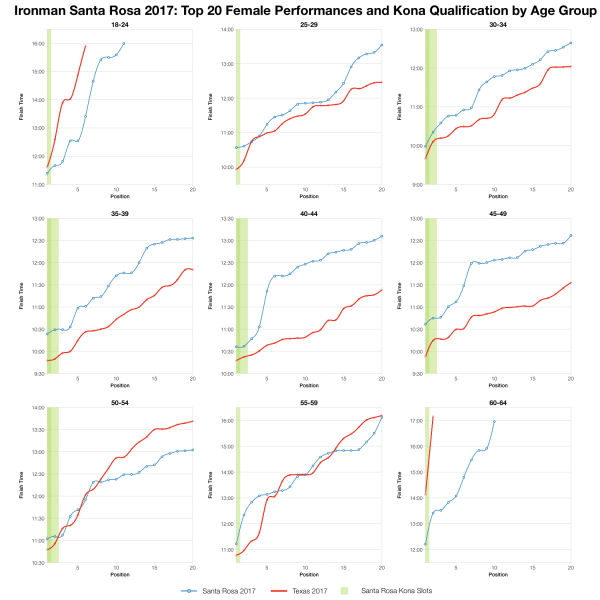 You can compare these with other races on my Kona qualification page. 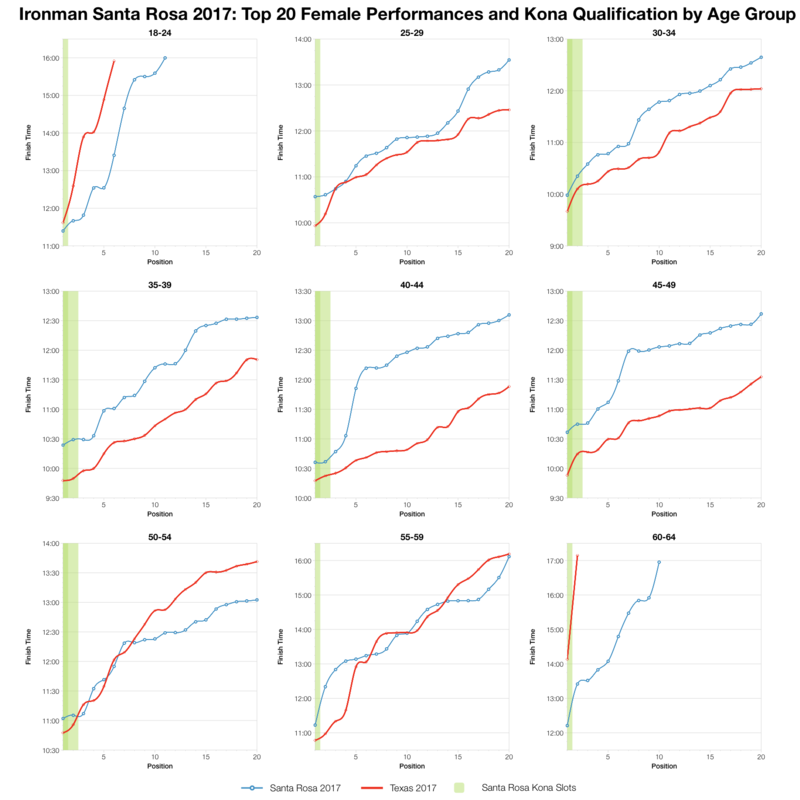 You can access a spreadsheet of the full results from Ironman Santa Rosa 2017 on my Google Drive.